Starting August 26th at Downtown Disney's World of Disney store, you can ruin your child's dreams by subjecting them to the newest D-Tech experience. Last seen in the smash success Carbon-Freeze Me experience at Star Wars Weekends, this time the D-Tech technology is placing your child's face on a Disney Princess figurine. Unfortunately, the results make being frozen in carbonite seem not so bad. 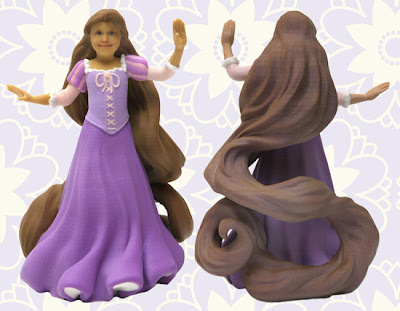 Maybe they'll improve the figures for final release, but as it stands, the combination of distorted child's face and princess body is quite disturbing and unsettling. I can definitely see some distraught children when these arrive in the mail after getting home from vacation. If you wish to unleash these abominations upon your household, the cost is $99.95 plus shipping and includes a princess charm bracelet. Only children age 3 to 12 will be subjected to the mental torture. The experience is supposed to be available for a limited time only, which means it will last until the horde of angry parents show up with their pissed off little princesses to tear it down. Reservations are recommended.